(1 “In House" Field Trip with 80 second graders) - A group of children from Garfield Community Magnet School had an “In House Field Trip” with a program called “Top Secret Science.” Top Secret Science is a program that creates a high level of enthusiasm and inquisitiveness about science and technology for young children. The program offered the second graders a fascinating, hands-on learning experience that covered topics in balance, centrifugal force, and airplanes. All the children had an incredible time and were able to take home 3 science experiments they created with their hands and mind! 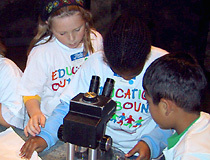 (2 trips in Nov. ‘00) - the children engaged in the fascinating world of rocks and minerals. They saw and touched rocks from all around the world and experienced exhibits that stimulated their minds. (3 trips in May of ‘01) - the children explored space and the solar system through spectacular throughout the museum and from an exciting planetarium show. They were able to travel through the universe in a merry chase to capture Carmen Sandiego and regain the stolen rings of Saturn. 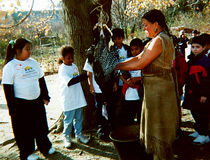 (5 trips in the fall ‘01, 2 trips in the spring ‘01 and 3 trips in the fall ’00) - the children experienced a 1620’s setting of a Native American Homesite and a Pilgrim Village. They were able to directly communicate with the English Colonists and Native Americans and touch, feel, smell, and see the lives of our country’s forefathers. 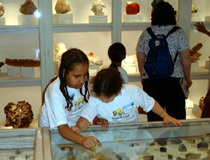 (3 trips with 6 second grade classrooms in June of ’02) - four classrooms attended the “Rocks and Minerals” Discovery Class where they became geologists and explored the incredible world of rocks and minerals. The other two classrooms attended the “Igloos to Adobe” Discovery Class where they explored North America’s diverse land and native cultures. 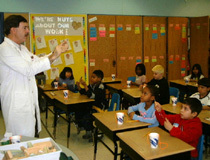 (3 trips with 6 second grade classrooms in March of ’02) - the children participaed in the “Dig into Fossils” Discovery Class. The program blended activity-oriented, inquiry-based learning with a hands-on approach to help the children develop a better understanding of fossils. (1 trip in May of ‘01) - the children watched the spectacular show Charlotte’s Web.